Two and a half months ago the north plaza at Rogers Arena was the place to be before and after Canucks playoff games. It was again the place to be Wednesday afternoon, but face painting, a live deejay and bubbling anticipation was replaced with tears, sadness and grieving as Vancouver fans gathered to remember former Canucks forward Rick Rypien two days after his sudden passing. Upward of 300 fans visited the plaza yesterday afternoon beginning at 2 o’clock; they wore t-shirts and jerseys, brought flowers and signs and were both silent and talkative in paying their respects to the 27-year-old who passed away Monday. 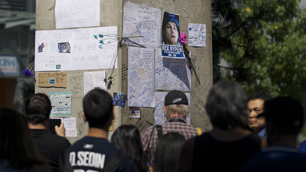 A makeshift memorial for Rypien began hours after it was confirmed he passed away as fans began dropping off tokens of kindness and writing epitaphs on large sheets of white paper taped to one of the skytrain pillars. Twenty-four hours later the memorial had doubled in size and fans like Calvin Ng began spending time outside of it remembering Rypien. 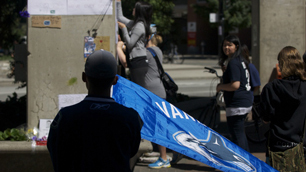 Ng, head to toe in Canucks gear holding a large team flag, stood as still as the Roger Neilson statue nearby for hours Tuesday before returning Wednesday. “It really is a tragic thing whenever an athlete passes away, but it really hits when it’s a member of the team that you call your favourite,” said Ng. “I just thought that coming out here and giving something at the memorial would be doing my part to remember Rick." While Ng stood out Tuesday as one of just a handful of fans at the memorial, there were many more a day later as Alex Ransford helped organized fans for a showing of solidarity Wednesday. Initially the 17-year-old high school student was going to drop off some flowers with her mom Ellen, but she used the power of social media to do something bigger. Ransford created a Facebook event to gather people at Rogers Arena for Wednesday at 2 p.m., she then bought two large books for fans to sign that she is sending to Rypien’s family. “We were just going to come down and bring some flowers and write a little note and then we had the idea of bringing condolence books when we found out so many more people were coming,” said Ransford. Vancouverite Dave Morgan also has an offering he’s hoping to get to the Rypien family: the last home jersey Rypien wore as a member of the Manitoba Moose last season. The Moose sell off game-worn jerseys after the year and Morgan, whose first ever game-worn jersey is a Rypien #11 Moose sweater, jumped at the chance to acquire another piece of memorabilia from his favourite player. “This jersey has great hockey memories for me, with the Moose watching Rick play, and if it brings me that many memories, I’m wondering if it would bring the family those memories as well of seeing him on the ice,” said Morgan, who knew there was something special about Rypien early on. Now it’s time to pass the jersey along to where it belongs. On Wednesday it was the fans that didn’t disappoint showing up in waves making the Rypien memorial one worthy of the scrappy forward. “It’s a big deal, it’s a very big deal, it’s a huge loss, he did a lot for the team and the community and the fans, he’ll definitely be missed,” said Andrew ‘the crazy Canuck,’ donning a Canucks jersey, blue face paint and a wacky white and blue wig, beaming with pride at the turnout.